Johnson, Pope, Ruppel & Burns, LLP. Lawyers representing the Church of Scientology pocket millions by helping it achieve its ends. Perjury, victim-blaming, obstructing justice–it appears that any tactic is perfectly acceptable in the defense of Scientology. Within several weeks of his son’s death, Tom Brennan hired attorney Paul Johnson from the law firm of Johnson, Pope, Ruppel & Burns, LLP. It’s fairly obvious, however, that it wasn’t Brennan who was paying for the legal representation. How so? So, who had the upper hand in the police investigation? Was it Detective Stephen Bohling of the Clearwater Police Department or attorney Paul Johnson from the law firm of Johnson, Pope, Ruppel & Burns, LLP? 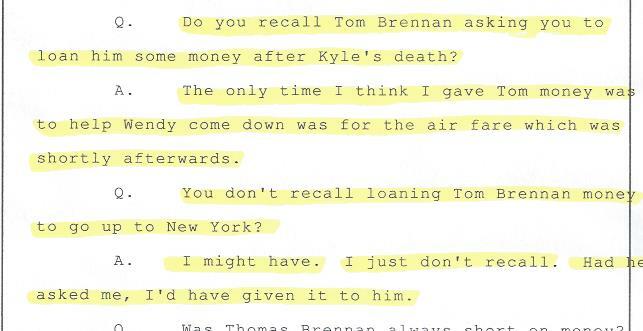 Perhaps surprisingly, Tom Brennan—Kyle’s father and the surviving person who knows best what happened on the night of February 16, 2007—was interviewed by the police three times . . . and yet none of the notes taken by the interviewing police officers survive, none! Brennan was first interviewed by Clearwater Police Officer Jonathan Yuen on the night of the tragedy. Yuen later claimed that he destroyed his notes. The second interview—conducted by Detective Stephen Bohling—took place on March 6, 2007. He also said that he destroyed his notes. Is this standard operating procedure for the Clearwater Police Department?! If it is, it’s certainly not supposed to be. Should a police officer who arrives first at a potential crime scene destroy his notes? Not according to the U.S. Department of Justice handbook entitled “Eyewitness Evidence” (available online at https://www.ncjrs.gov/pdffiles1/nij/178240.pdf). On page 14 it states “that a preliminary investigating officer shall obtain and accurately document and preserve information from the witness(es). Preservation and documentation . . . are necessary for a thorough preliminary investigation.” Throughout the handbook, “documentation” of information obtained, and the “preservation” of that information is stressed. What about the documentation of Brennan’s third police interview? According to Bohling, on November 8, 2007, he requested a third Brennan interview. When Bohling contacted attorney Paul Johnson to arrange a date and time, Johnson stated that he wanted to monitor the telephone conversation between Bohling and his client. 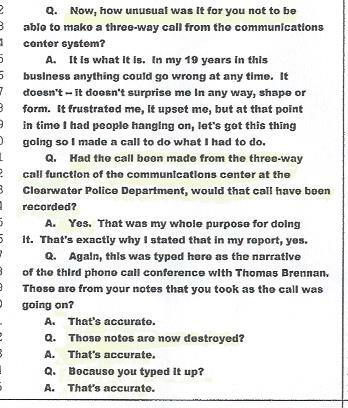 This would require a three-way call, and this police interview—if conducted from the Communications Center at the Clearwater Police Department—would have automatically been recorded. However, Detective Stephen Bohling—who by 2007, had worked the bulk of his nineteen years as a police officer with the Clearwater Police—later testified that he couldn’t figure out how to utilize the police department’s three-way call system in order to record the interview. Why didn’t he simply ask someone for help? Is Bohling so incompetent that 1) he couldn’t remember how to use equipment he’d used before, and 2) he didn’t comprehend that somebody at the police department must have known how to operate the three-way system, and 3) he was incapable of asking for help or was there possibly a reason that the detective didn’t want the interview recorded in the first place? According to Bohling’s police report, attorney Paul Johnson saved the day by offering to do the three-way interview using the system at his law firm. But Bohling—in perhaps a ham-handed attempt to manipulate the information—contradicted himself in his own report. On page 29, he stated that “Attorney Johnson advised [on November 8, 2007] that he did not wish to have the interview with Thomas Brennan recorded.” And, of course, the lawyer from the Scientology-funded firm of Johnson, Pope, Ruppel & Burns, LLP got his wish. 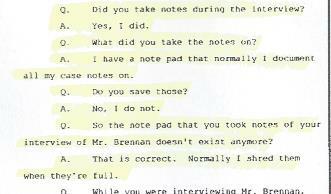 The third and final interview with Brennan went unrecorded and all the notes taken by the detective were destroyed. Any reasonable person would have to wonder why. All of this—the lies, the mishandling of information, the obstruction of justice—came at the expense of a twenty-year-old college student whose existence—to the powerful and corrupt powers-that-be in Clearwater, Florida—was absolutely meaningless. In February 2007 my twenty-year-old son, Kyle paid a visit to his Scientologist father, Tom Brennan, in Clearwater, Florida, the site of the Church of Scientology’s world headquarters. Kyle—who was not a Scientologist—was under the care of a psychiatrist who had prescribed for him Lexapro, an antidepressant. One of the major tenets of Scientology is that psychiatry and psychiatric medications are evil: they’re forbidden. As a practicing Scientologist, Brennan could not have a relationship with Kyle if Kyle was violating that tenet. (In fact, according to Scientology, Kyle’s use of his prescribed medication made him an “SP”—a “Suppressive Person”—someone to be reviled and avoided.) So Brennan reported this state-of-affairs to his Scientology “auditor,” Denise Miscavige Gentile—twin sister of Scientology’s leader, David Miscavige—and to his other superiors in the Church. Even though Kyle was not a Scientologist, Brennan received written orders from the Church to remove his son from his apartment and “handle” the situation per Scientology policy. Thirty-six hours later Kyle was dead. Detective Stephen Bohling of the Clearwater, Florida, Police Department was the lead investigator looking into Kyle’s extremely suspicious death. His investigation, however, was careless and sloppy, even perjurious. Many quandaries were left unanswered and several deponents who’d obviously contradicted themselves walked away without further questioning. Bohling’s official police report, as can be imagined, was riddled with half-truths and lies. Facts critical to the case were omitted. Detective Bohling was deposed on July 12, 2010, by Attorney Lee Fugate (the attorney representing defendant’s Denise Miscavige Gentile and her husband Jerry Gentile). During the direct examination, the Clearwater detective comes across as compassionate and caring—in fact overly-so, like someone overcompensating to counteract his real personality. During Fugate’s questioning, too, Bohling lied about the “thoroughness” of his investigation, making it appear that he’d examined the case from every angle, pursued all the possibilities. “Apparently . . . you acted immediately upon each of the suggestions that he [Kyle’s older brother Scott] made to you and followed up on those?” asked Fugate. “I believe that I did as I documented it,” answered Bohling. “I felt that I had an obligation to the family to follow up on any concerns that they had and I did just that.” Nothing could be further from the truth. The list of unanswered questions—and obvious contradictory statements made by the defendants—presented to Bohling by Kyle’s family in the vain hope of finding the truth fills several pages. Most disturbing, however, was how Bohling—under oath and in official documents—fabricated a false image of me, a grieving mother. He portrayed me as borderline hysterical, someone unable to accept the death of her child, someone making unrealistic demands and absurd accusations. “It was difficult at times to try and explain things to Victoria in a manner that she would understand. . . .” stated Bohling in his deposition. “At times I was accused of things that were just not true. You know, that I had connections to the Church of Scientology. I was being paid by the Church of Scientology.” More lies by Detective Bohling—I never accused him of being a Scientologist or of being paid by the Church. Bohling claimed, too, that he told Lirot he wanted “communication to go on with Victoria.” He also claimed he said: “I wanted her [Victoria Britton] to be aware of what was going on with her son’s case. . . .” Then why is it that this meeting was the only contact between Bohling and Attorney Lirot until Bohling closed the case in November of 2009, just two months shy of the Florida statute of limitations’ deadline? Was Detective Bohling really interested in keeping Kyle’s family informed? Was he actually interested in resolving those unanswered questions? The answer to that question is found in a July 1, 2008, letter from Attorney Lirot to Detective Bohling, a letter written almost eleven months after the above-described open-lines-of communication meeting. “After being retained in June of 2007,” wrote Lirot, “I cannot be surprised that my client thinks that I am incapable of getting any final answers on the investigation involving the death of Kyle Brennan. I will not level any criticism at you or the CPD [the Clearwater Police Department], but where does this investigation stand?” Here Attorney Lirot’s dissatisfaction with Bohling’s lack of communication is clearly evident. The result of Detective Bohling’s fraudulent behavior was a miscarriage of justice. Bohling’s police report is a collection of misrepresentations, half-truths, and outright lies. As soon as this public document became available, the Scientology lawyers—the attorneys representing Scientologists Tom Brennan, and Denise and Jerry Gentile, as well as the Church itself—tacked it onto their motion for summary judgment (their request that the judge rule in their favor and dismiss the case before it went to trial). Detective Bohling’s fabricated police report made sure that my point of view regarding this case—my list of unanswered questions and glaring contradictions—was never heard by a Florida jury. Indeed, Kyle’s extremely suspicious death was never properly investigated in the first place. Detective Stephen Bohling made sure of this by falsely claiming that he’d conducted a thorough investigation. According to Bohling and subsequently the Scientology lawyers, Kyle’s death was investigated by not one, but by three separate agencies. This misrepresentation appeared in court documents filed in the Federal Middle District Court of Florida, and in court documents submitted to the Eleventh Circuit Court of Appeals located in Jacksonville, Florida. What were the three Florida agencies that supposedly left no stone unturned while investigating Kyle’s suspicious death? : Bohling’s Clearwater Police Department, the State Attorney’s Office, and the Florida branch of the Federal Bureau of Investigation, the FBI. There is a kernel of truth at the core of this statement. I contacted the Florida State Attorney’s Office and the FBI regarding Detective Stephen Bohling’s unprofessional behavior and shoddy investigation. All of that correspondence I carefully saved and filed. Here’s the pertinent question: Was Kyle’s case investigated by the FBI as claimed by the defendants’ attorneys? No, it was not. What’s disturbing about Doug Barry’s investigative work—is the lack of it. Kyle’s case was less than a year old when Barry was assigned to look into it. And it would be wrong to conjecture exactly what information Detective Bohling provided when he “opened” his books. I, too, opened my books for Barry—I wrote to him about the numerous times Kyle’s father, Tom Brennan, had contradicted himself in statements made within days of Kyle’s death. “The result of Barry’s “investigation” In a letter dated June 27, 2008, Barry stated that, in fact, he did not conduct an independent investigation—he merely “reviewed” Bohling’s incomplete report. One thing is certain: The State Attorney’s Office sending Doug Barry—a former Clearwater policeman—to look into the misconduct of a detective from his former workplace is a perfect example of that popular ancient proverb about the fox guarding the henhouse. Anybody would have to conclude that in the State of Florida justice cannot be found when it involves the Church of Scientology. My youngest son, Kyle Brennan, was declared dead from a gunshot wound to the head just past midnight on February 17, 2007, in the Clearwater, Florida, apartment of his Scientologist father, Tom Brennan. The circumstances of his violent death were—and still remain—extremely suspicious. The reasons are many: The horribly mismanaged police investigation during which crucial evidence was either not gathered, not processed, or purposely lost; The numerous lies told by Police Detective Stephen Bohling (lies to our family, lies strategically placed in his police report); And the innumerable lies told by the defendants—celebrity Scientologists that Kyle (who was not a Scientologist) had the extreme misfortune to be surrounded by in the last days of his young life. Clearwater is the Church of Scientology’s worldwide headquarters, and Tom Brennan’s Cleveland Street apartment was in close proximity to Scientology central—across the street from the Coachman Building (a Scientology training center), and just one block from Scientology’s main building, the Fort Harrison Hotel. Just as Scientology structures dominate downtown Clearwater, the religion also dominated the subsequent police investigation, and the wrongful-death lawsuit filed in February 2009 on behalf of the Estate of Kyle Brennan. Listed as defendants were: Scientologists Tom Brennan (Kyle’s father), Denise Miscavige Gentile (twin sister of Scientology’s controversial leader, David Miscavige), her husband Gerald Gentile, the Church of Scientology itself, and Flag Service Organization, Inc. (or FSO, the Church’s so-called “spiritual headquarters”). This is the stratagem they used against me. Despite the fact that they’d stopped our wrongful-death lawsuit—effectively muffling anything said legally on behalf of my dead son—they proceeded, after their victory, to sue me for just under $1 million. Fortunately, the judge threw this attempt out. Who pays the price when the rule of law is purposely distorted in order to bully honest citizens into submission? And what of Scientology’s next set of victims? How many more will suffer because the bullies haven’t been stopped? On August 27, 2008, defendant Denise Miscavige Gentile, with her attorney in tow—Lee Fugate from the law firm of Zuckerman, Spaeder, LLP—arrived at the Clearwater Police Department for her first and only police interview. It was conducted by Detective Stephen Bohling (who headed up the investigation into Kyle’s death). Eighteen months had passed since Kyle had died. This statement by Bohling—“I’m more than willing to work with you . . . on this case”—might seem innocuous, but it was made by a detective who subsequently falsified police information, committed perjury, and seemingly aided and abetted the defendants in the evasion of justice. Extremely troubling, too, is that during this recorded interview Fugate refers to a previous conversation with Bohling, perhaps a phone conversation. 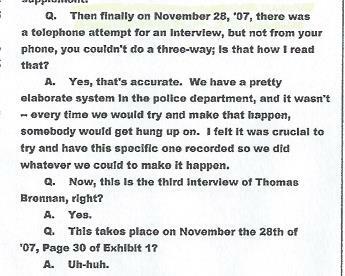 The fact that this attorney/detective communication was not documented raises additional questions. Bohling’s subsequent lie-filled police report was attached to Denise Miscavige Gentile and husband Gerald’s answer/response to the wrongful-death complaint filed by attorney Lee Fugate and later used in court documents filed in federal court by the defendants. This is how the defendants weaseled their way out of the wrongful-death lawsuit. This is how they escaped justice. It all began with Detective Bohling helping these celebrity Scientologist defendants. Here are the documented facts: Dr. McNamara was deposed on June 16, 2010. Under oath, Dr. McNamara expressed astonishment at the lies told by the police detective, perjury committed at the expense of an innocent twenty-year-old. Moments later, Dr. McNamara stated under oath that he’d never spoken at all to Detective Bohling about Kyle, never! 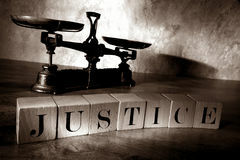 Truth is what drives our judicial system. Everything is based on this simple, and very necessary, virtue. For this reason, the public is always willing to give a police officer, or police detective, the benefit of the doubt. This despite the unfortunate fact that public servants sometimes lie, commit perjury, and obstruct justice. When an officer betrays his responsibilities—betrays his Oath of Honor—in this fundamental way, he makes a mockery of our judicial system. Criminals escape justice, lives are ruined and lost, families are crushed. Unfortunately, this illegal behavior by Stephen Bohling had a direct impact on the outcome of my wrongful-death lawsuit. What became of Detective Stephen Bohling? He quietly retired from the Clearwater Police Department. Five years after Kyle’s death, an interesting story was reported by WTSP News in Tampa. On November 9, 2012, Mark C. Rathbun—Scientology’s former number-two man—gave sworn testimony accusing Clearwater-area judges and lawyers of criminal wrongdoing regarding another Scientology-related lawsuit. Statement of Mark C. Rathbun, a former senior executive of the Church of Scientology. Token from Lisa McPherson’s services after her death in 1995. Rathbun alleged that the Church of Scientology spent at least $30 million to cover up the tragic 1995 death of a woman in Scientology care. This was Scientologist Lisa McPherson, who, after a minor traffic accident, told fellow Scientologists she needed psychiatric help. Instead, they took her to the Fort Harrison Hotel—the religion’s headquarters—where McPherson died seventeen days later. Her family sued the Church of Scientology saying they’d simply let her die. Criminal prosecution was brought by the Pinellas State Attorney’s office. And Rathbun had something to say about attorney Lee Fugate. In his sworn testimony, Rathbun stated that Fugate, a former prosecutor, was hired by he and Scientology leader David Miscavige to have illegal ex parte meetings with judges involved in the McPherson case. (“Ex parte,” means one-sided, partisan.) According to Rathbun, those extra-legal meetings, plus the liberal rewarding of “at least $30 million,” got the charges dropped and lessened the damages in the civil suit. WTSP News claimed that the story had many other twists and turns. “Stay tuned,” they said. Unfortunately, WTSP News never provided a follow–up. 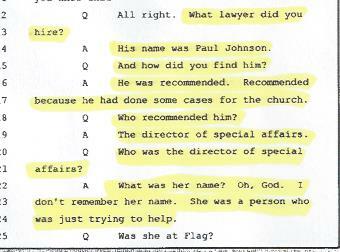 During my deposition in 2010, I had an interesting exchange with Lee Fugate. Following my complaint about the pathetically poor police investigation into Kyle’s death, attorney Fugate had the gall to ask: “[W]hat investigation did you conduct [Mrs. Britton] and what did you do to preserve the findings of that investigation. . . ?” Evidently, Fugate believes that in Florida private citizens are required to conduct their own police investigations. He believes that it’s a grieving parent’s responsibility to investigate the suspicious death of their child. In perfect lock-step with L. Ron Hubbard’s teachings, this is how the rule of law is contorted by Scientology’s lead counselors. This is how the morally bereft and aggressively litigious Church of Scientology continuously manages to get its way legally, even when it appears that its opponents have strong cases. Lying, victim-blaming, obstructing justice–it appears that any tactic is perfectly acceptable in the defense of the Church of Scientology. The narratives above are all copyright 2019, Victoria Britton. Grand jury investigation of Scientology from the State’s Attorney’s office. Sep 7, 2004 … 1985: CoS attorney, Paul B. Johnson is tried in Orlando, FL, for allegedly bribing Hillsborough County commissioners to favor his client, Hubbard Construction Co. He is later defended by F. Lee Bailey. If you have any questions contact Victoria at: vbreton2062 (at) gmail.com. Previous Previous post: Plea for information! This looks like a flat out lie by Medical Director Martha J. Scholl, for which she should be prosecuted for obstruction of justice and denying Kyle Brennan of his civil rights. Scholl according to the police was at the scene in the apartment working side by side with the police. No need to arrive at her false judgment that Kyle committed suicide based on simple assertion that the police said there was a suicide note (which of course there wasn’t).